Off the island of Aruba in the southern Caribbean, two sailboats are silhouetted against billowing clouds as the setting sun streaks the sky with orange and yellow. 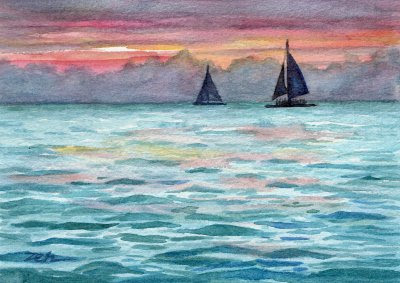 You can feel the gentle movement of ocean waves in this painting. What a peaceful scene!